Wool lasts for years without losing its resilience (no body impressions). Wool is good for the heart; it significantly lowers heart rates. 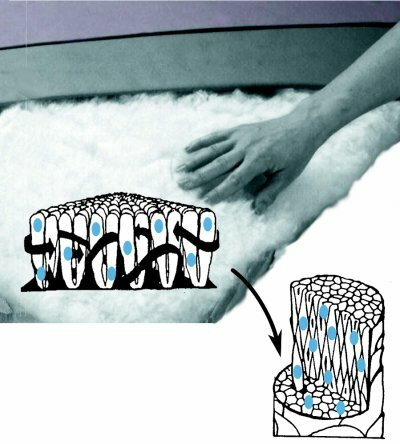 Wool's naturally resilient structure contains an abundance of air that provides natural cushioning. Wool wicks away moisture from the body and dries quickly. Wool is an insulator - historically, wool has been used in the heat of the desert and the coolest arctic climates. Wool is dust mite proof. Wool is mold and mildew resistant. warm in the winter, and always dry. Nothing, not even "down", has the superior qualities of wool. Wool's fibers are soft and springy, so they easily conform perfectly to your body's shape, smoothing out pressure points and thus improving poor blood circulation which is the cause of numbness. And, because wool can absorb up to 1/3 of its own weight in moisture and yet not feel damp, (on average, a person exhales and perspires 1 cup of fluid during sleep each night), it will continually draw moisture away from your body all night long, keeping you (and your sheets) cool and dry on hot muggy, summer nights! Wool gets rid of moisture seven times faster than feathers, down and synthetics, so it lets you sleep more comfortably. Water makes you hot and sweaty in a warm environment and cold and clammy in a cool environment. Moisture is what attracts mold, mildew and dust mites. The allergies caused by these organisms result in increased tossing and turning as your nose gets stuffy or your throat gets dry. On cold nights, you can keep the bedroom thermostat set low for easy breathing because wool will then keep you cozy and warm as it traps and holds your own body heat. Wool is truly the insulating miracle of creation. That's why desert dwellers wear woolen clothing. It keeps them cool and dry during the hot, burning day, yet warm during the cold, frigid nights. No other product can offer you all the benefits of pure wool. Wool is flame resistant and antimicrobial treated to prevent odors, mildew, germs, fungus, and dust mite infestation. A Removable, Launderable, Dust Mite Proof, Wool Filled Top.